training fast with weights is dangerous and less productive. This little gem Molding a Mighty Arm (copyright 1930) is part of my library collection of old and rare strengthening books. 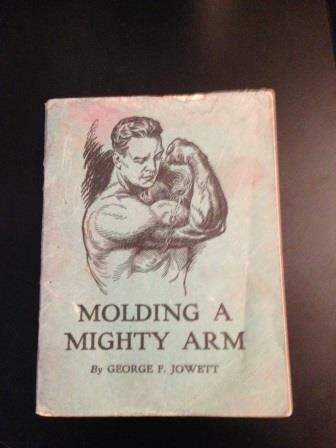 The author, George F. Jowett, was a turn of the century strength and physique guru. As many of you know all too well, I often argue with other experts in the field of personal training and strength exercise. These passive and friendly FRED talks cover a myriad of issues but mainly over repetition speed or tempo. Many experts belittle slow rep tempo training. Their main beef with it is that they think it cannot build much beef. This error in thinking is usually due to their misinterpretations of certain physiological principles of exercise. Most of these arguments revolve around the misguided idea that lifting weights rapidly selectively recruits the so-called fast twitch muscle fibers and that slow reps don’t. The fast twitch fibers are the fibers most responsible for hypertrophy (muscle growth) and strength. Henneman’s size principle states that under load, motor units are recruited from smallest to largest. In practice, this means that slow-twitch, low-force, fatigue-resistant muscle fibers are activated before fast-twitch, high-force, less fatigue-resistant muscle fibers. The speed with which you lift a weight is not a factor in determining what fibers are called upon to contract. What matters is the amount of force and the degree of effort one generates. In other words, the greater the effort you put forth and the harder the effort becomes, the more likely you are to engage the fast twitch fibers. As en example, pushing your bicycle with a flat tire off the road as fast as you can does NOT recruit more fast twitch fibers than trying to push your Hummer that has a flat tire off the road as fast as you can. The former results in very rapid muscular contractions and the latter very, very slow muscular contractions. But the latter require much more physical effort. Another example: A sprinter running as fast as he can in the 100 meter race will NOT recruit more fast twitch fibers than if he tried to run as fast as he can in the 100 meter race with a 50 pound vest on. With the vest on, he will run much slower but the effort will be much greater thus recruiting more fast fibers. When a set of any exercise is taken to complete fatigue, the effort is the greatest. All types of fibers – both fast and slow twitch – are recruited. If you train to complete fatigue using ANY rep tempo, you will recruit the fast fibers. But explosive reps have the unfortunate side effect of screwing up your joints but good. He means six times to fatigue to begin with and build from there. Now, what does he mean by “fairly slow”? We just don’t know. But he didn’t say to perform the lift explosively as many experts suggest today. You’ll also notice if you read the whole snippet that he ain’t too keen on cheating. Much of the information you hear today on weight training is dangerous fast-speed nonsense that will leave you injured (Crossfit, Parkour, plyometrics, etc.) and with less total strength and muscle mass than you might otherwise enjoy. F=ma peeps. I’ve had no problem building muscle using a slow protocol, as an ex competitive powerlifter my training was completely opposite from Slow Burn. I don’t think its a good way to train for a maximum bench press for example but as far as building muscle, I believe it to be superior. Slow Burn is about concentrating the effort in the muscle you’re trying to work whereas when I was powerlifting I tried to get as much muscle as possible into the lift, shorten the distance the bar had to move, and to use momentum as much as possible. 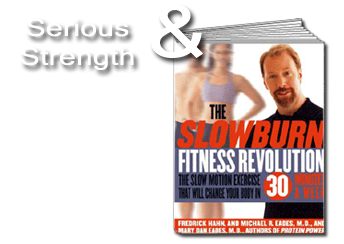 I’ve said many times in print that I found the Slow Burn protocol for me to be the most effective of the “slow” training (although I use 3 – 5 reps most of the time, a very minor difference than the 3 – 6) and found it to be a very effective way to build muscle safely and despite not doing any powerlifting training in about 5 years my strength is still there. I really like the vehicle and sprinting examples. I like the pointing out of heavier resistance resulting in slower movement, BUT requiring more effort. Can you tell me how to find a slow burn certified personal trainer? I’ve been thinking about that regarding my training, just in case I might be doing something wrong or could be using the techniques more efficiently. Is there a board or group or something I can consult to see if there is one near me? Hey Freddy, can your slow protocol be used with bodyweight exercises? Sure why not! I have a bunch on my book The Slow Burn Fitness Revolution! Can you tell me how to find a trainer in the metro DC/ Maryland/ Northern Virginia who can instruct me in the slow burn method? Thanks! I don’t know of anyone in that area who does Slow Burn, so sorry Cynthia. I’ve deleted the link since it has nothing at all to do with Molding a Mighty Arm and strength training. – Kettlebells. Despite the hype and claims, even their trainers admit to the lack of safety in their use as prescribed. eg One author/”trainer”/RKC wrote swings create 4x – 10x their weight in force when the KB is parallel to the ground. 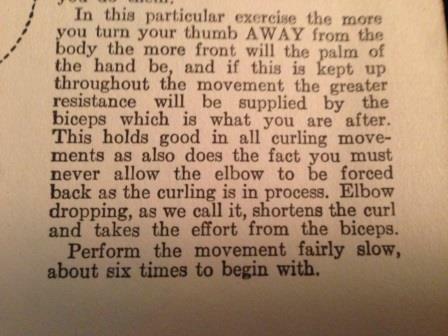 Clarence Bass writes of low back issues while performing KB swings. And even the British military–remember KBs originated in Scotland & had been used by the British military–has either banned or discouraged their use. – Clubbells. Another one which creates excessive force, this time on the wrists and elbows created by the speed & force.